Updated frequently, and most recently 8 February 2015.
or “Enter.” Note that this essay has grown from a few thousand words in January 2013 to the current massive missive. A German-language version of this essay, updated 26 June 2014, is available in pdf form here. A Russian version focused on self-reinforcing feedback loops, courtesy of Robin Westenra and colleagues, is here. A Polish version, updated often, is available here. I’m often accused of cherry picking the information in this ever-growing essay. I plead guilty, and explain myself in this essay posted 30 January 2014. My critics tend to focus on me and my lack of standing in the scientific community, to which I respond with the words of John W. Farley: “The scientific case is not dependent on citation of authority, no matter how distinguished the authority may be. The case is dependent upon experimental evidence, logic, and reason.” In other words, stop targeting the messenger. American actress Lily Tomlin is credited with the expression, “No matter how cynical you become, it’s never enough to keep up.” With respect to climate science, my own efforts to stay abreast are blown away every week by new data, models, and assessments. It seems no matter how dire the situation becomes, it only gets worse when I check the latest reports. The response of politicians, heads of non-governmental organizations, and corporate leaders remains the same, even though they surely know everything in this essay. They’re mired in the dank Swamp of Nothingness. Margaret Beckett, former U.K. foreign secretary said in September 2008 on BBC America television, with respect to climate change: “Will it harm our children? Will it harm our grandchildren? Actually, it’s a problem for us today.” As Halldor Thorgeirsson, a senior director with the United Nations Framework Convention on Climate Change, said on 17 September 2013: “We are failing as an international community. We are not on track.” These are the people who know about, and presumably could do something about, our ongoing race to disaster (if only to sound the alarm). Tomlin’s line is never more germane than when thinking about their pursuit of a buck at the expense of life on Earth. Worse than the aforementioned trolls are the media. Fully captured by corporations and the corporate states, the media continue to dance around the issue of climate change. Occasionally a forthright piece is published, but it generally points in the wrong direction, such as suggesting climate scientists and activists be killed (e.g., James Delingpole’s 7 April 2013 hate-filled article in the Telegraph). Leading mainstream outlets routinely mislead the public. Mainstream scientists minimize the message at every turn, with expected results. As we’ve known for years, scientists almost invariably underplay climate impacts (James Hansen referred to the phenomenon at “scientific reticence” in his 24 May 2007 paper about sea-level rise in Environmental Research Letters. And in some cases, scientists are aggressively muzzled by their governments. Canada no longer allows some climate-change information into the public realm. Even museums are not safe from misinformation about climate science to appease fossil-fuel philanthropists, as reported in the 17 June 2014 issue of AlterNet. I’m not implying conspiracy among scientists. Science selects for conservatism. Academia selects for extreme conservatism. These folks are loathe to risk drawing undue attention to themselves by pointing out there might be a threat to civilization. Never mind the near-term threat to our entire species (most couldn’t care less about other species). If the truth is dire, they can find another, not-so-dire version. The concept is supported by an article in the February 2013 issue of Global Environmental Change pointing out that climate-change scientists routinely underestimate impacts “by erring on the side of least drama” (also see overviews of this phenomenon from 21 May 2014 and from 15 July 2014, the latter from the U.S. National Research Council as reported by Truth-out). Even the often-conservative Robert Scribbler points out in his 18 July 2014 essay: “NASA’s CARVE study has been silent for a year, the University of Maryland has stopped putting out publicly available AIRS methane data measures, the NOAA ESRL methane flask measures, possibly due to lack of funding, haven’t updated since mid-May, and even Gavin Schmidt over at NASA GISS appears to have become somewhat mum on a subject that, of late, has generated so much uncomfortable controversy.” (Apocalypse 4 Real blog responded to Scribbler on 24 July 2014, and the response is linked here.) Schmidt increased his efforts to discredit the work of other scientists in early October 2014 with unfounded, unprofessional behavior. Almost everybody reading these words has a vested interest in not wanting to think about climate change, which helps explain why the climate-change deniers have won. I’m often told Earth can’t possibly be responsive enough to climate change to make any difference to us. But, as the 27 May 2014 headline at Skeptical Science points out, “Rapid climate changes more deadly than asteroid impacts in Earth’s past.” That’s correct: climate change is more deadly than asteroids. Ever late to the party, the Intergovernmental Panel on Climate Change (IPCC) admits global warming is irreversible without geoengineering in a report released 27 September 2013. The IPCC is among the most conservative scientific bodies on the planet, and their reports are “significantly ‘diluted’ under political pressure.” On 22 April 2014, Truth-out correctly headlines their assessment, “Intergovernmental Climate Report Leaves Hopes Hanging on Fantasy Technology.” Time follows up two days later with a desperate headline, “NASA Chief: Humanity’s Future Depends On Mission To Mars” (first up: greenhouses on Mars). As pointed out in the 5 December 2013 issue of Earth System Dynamics, known strategies for geoengineering are unlikely to succeed (“climate geo-engineering cannot simply be used to undo global warming“). “Attempts to reverse the impacts of global warming by injecting reflective particles into the stratosphere could make matters worse,” according to research published in the 8 January 2014 issue of Environmental Research Letters. In addition, as described in the December 2013 issue of Journal of Geophysical Research: Atmospheres, geoengineering may succeed in cooling the Earth, it would also disrupt precipitation patterns around the world. Furthermore, “risk of abrupt and dangerous warming is inherent to the large-scale implementation of SRM” (solar radiation management), as pointed out in the 17 February 2014 issue of Environmental Research Letters. About a week later comes this line from research published in the 25 February 2014 issue of Nature Communication: “schemes to minimize the havoc caused by global warming by purposefully manipulating Earth’s climate are likely to either be relatively useless or actually make things worse.” Finally, in a blow to technocrats published online in the 25 June 2014 issue of Nature Climate Change, a large and distinguished group of international researchers concludes geo-engineering will not stop climate change. As it turns out, the public isn’t impressed, either: Research published in the 12 January 2014 issue of Nature Climate Change “reveals that the overall public evaluation of climate engineering is negative.” Despite pervasive American ignorance about science, the public correctly interprets geo-engineering in the same light as the scientists, and contrary to the techno-optimists. Unimpressed with evidence and public opinion, some scientists forge on, illustrating that the progressive perspective often means progresssing toward the cliff’s edge. As reported in the 27 November 2014 issue of New Scientist, initial efforts to cool the planet via geo-engineering have taken shape and might begin in two years. The IPCC operates with a very conservative process and produces very conservative reports for several reasons, among them the failure to include relevant self-reinforcing feedback loops. And then governments of the world meddle with the reports to ensure Pollyanna outcomes, as reported by a participant in the process (also see Nafeez Ahmed’s 14 May 2014 report in the Guardian and the 3 July 2014 paper in National Geographic). According to David Wasdell’s May 2014 analysis, which includes a critique of the IPCC’s ongoing lunacy, “equilibrium temperature increase predicted as a result of current concentration of atmospheric greenhouse gasses is already over 5°C.” I see no way for humans to survive such a rise in global-average temperature. Not to be outdone, now that abrupt climate change has entered the scientific lexicon, is dire news published in the 25 July 2014 issue of Science. “The study found that synchronization of the two regional systems began as climate was gradually warming. After synchronization, the researchers detected wild variability that amplified the changes and accelerated into an abrupt warming event of several degrees within a few decades.” Global-average temperature rising “several degrees within a few decades” seems problematic to me, and to anybody else with a biological bent. As reported eight days later in Nature Climate Change, rapid warming of the Atlantic Ocean, likely caused by global warming, has turbocharged Pacific Equatorial trade winds. Currently the winds are at a level never before seen on observed records, which extend back to the 1860s. When this phenomenon ceases, likely rapid changes will include a sudden acceleration of global average surface temperatures. If you’re too busy to read the evidence presented below, here’s the bottom line: On a planet 4 C hotter than baseline, all we can prepare for is human extinction (from Oliver Tickell’s 2008 synthesis in the Guardian). Tickell is taking a conservative approach, considering humans have not been present at 3.3 C or more above baseline (i.e., the beginning of the Industrial Revolution, commonly accepted as 1750). I cannot imagine a scenario involving a rapid rise in global-average temperature and also habitat for humans. Neither can Australian climate scientist Clive Hamilton, based on his 17 June 2014 response to Andrew Revkin’s fantasy-based hopium. According to the World Bank’s 2012 report, “Turn down the heat: why a 4°C warmer world must be avoided” and an informed assessment of “BP Energy Outlook 2030” put together by Barry Saxifrage for the Vancouver Observer, our path leads directly to the 4 C mark. The conservative International Energy Agency throws in the towel on avoiding 4 C in this video from June 2014 (check the 25-minute mark). The 19th Conference of the Parties of the UN Framework Convention on Climate Change (COP 19), held in November 2013 in Warsaw, Poland, was warned by professor of climatology Mark Maslin: “We are already planning for a 4°C world because that is where we are heading. I do not know of any scientists who do not believe that.” Among well-regarded climate scientists who think a 4 C world is unavoidable, based solely on atmospheric carbon dioxide, is Cambridge University’s Professor of Ocean Physics and Head of the Polar Ocean Physics Group in the Department of Applied Mathematics, Dr. Peter Wadhams (check the 51-second mark in this 8 August 2014 video), who says: “…the carbon dioxide that we put into the atmosphere, which now exceeded 400 parts per million, is sufficient, if you don’t add any more, to actually raise global temperatures in the end by about four degrees.” Adding to planetary misery is a paper in the 16 December 2013 issue of the Proceedings of the National Academy of Sciencesconcluding that 4 C terminates the ability of Earth’s vegetation to sequester atmospheric carbon dioxide. I’m not sure what it means to plan for 4 C (aka extinction). I’m not impressed that civilized scientists claim to be planning for it, either. But I know we’re human animals, and I know animals require habitat to survive. When there is no ability to grow food or secure water, humans will exit the planetary stage. And even Wikipedia accepts the evidence for near-term human extinction, as indicated by the caption on the figure below. 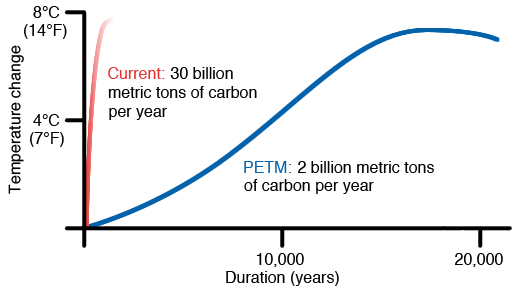 A 550ppm CO 2 level correlates to +9° C temperature rise, which was previously enough to trigger self-reinforcing climate change feedback loops leading to the Permian Extinction Event with 95% planetary die-off. 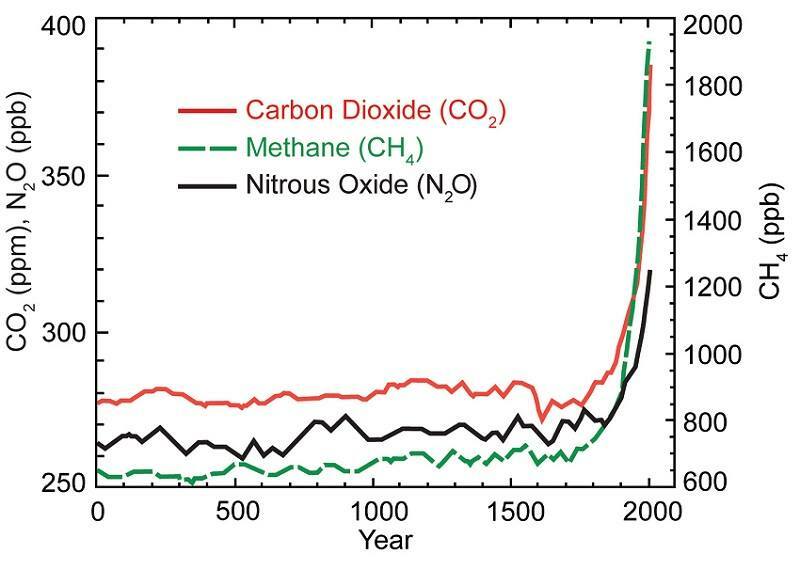 Even more worrying is that current levels of atmospheric methane (>1820ppb) indicate near-term human extinction. According to Colin Goldblatt, author of a paper published online in the 28 July 2013 issue of Nature Geoscience, “The runaway greenhouse may be much easier to initiate than previously thought.” Furthermore, as pointed out in the 1 August 2013 issue of Science, in the near term Earth’s climate will change orders of magnitude faster than at any time during the last 65 million years. Tack on, without the large and growing number of self-reinforcing feedback loops we’ve triggered recently, the 5 C rise in global-average temperature 55 million years ago during a span of 13 years (subsequently questioned in this paper from January 2015), and it looks like trouble ahead for the wise ape. This conclusion ignores the long-lasting, incredibly powerful greenhouse gas discovered 9 December 2013 by University of Toronto researchers: Perfluorotributylamine (PFTBA) is 7,100 times more powerful than carbon dioxide as a greenhouse gas in the atmosphere, and it persists hundreds of years in the atmosphere. It also ignores the irreversible nature of climate change: Earth’s atmosphere will harbor, at minimum, the current warming potential of atmospheric carbon dioxide concentration for at least the next 1,000 years, as indicated in the 28 January 2009 issue of the Proceedings of the National Academy of Sciences. Finally, far too late, the New Yorker posits a relevant question on 5 November 2013: Is It Too Late to Prepare for Climate Change? Joining the too-little, too-late gang, the Geological Society of London points out on 10 December 2013 that Earth’s climate could be twice as sensitive to atmospheric carbon as previously believed. New Scientist piles on in March 2014, pointing out that planetary warming is far more sensitive to atmospheric carbon dioxide concentration than indicated by past reports. As usual and expected, carbon dioxide emissions set a record again in 2013, the fifth-warming year on record and the second-warmest year without an El Nino. Another El Niño is on the way, as pointed out by Robert Scribbler on 6 March 2014: “Should the predicted El Nino emerge and be as strong as average model values indicate, global surface temperatures could rise by between .05 and .15 degrees Celsius …. This would be a substantial jump for a single year, resulting in yet one more large shift toward an ever more extreme climate.” Indeed, the upper end of the projected range takes us to 1 C warmer than baseline. All of the above information fails to include the excellent work by Tim Garrett, which points out that only complete collapse avoids runaway greenhouse. Garrett reached the conclusion in a paper submitted in 2007 (personal communication) and published online by Climatic Change in November 2009 (outcry from civilized scientists delayed formal publication until February 2011). The paper remains largely ignored by the scientific community, having been cited fewer than thirty times since its publication. According to Yvo de Boer, who was executive secretary of the United Nations Framework Convention on Climate Change in 2009, when attempts to reach a deal at a summit in Copenhagen crumbled with a rift between industrialized and developing nations, “the only way that a 2015 agreement can achieve a 2-degree goal is to shut down the whole global economy.” Politicians finally have caught up with Tim Garrett’s excellent paper in Climatic Change. From the Associated Press on 1 December 2014 comes a story headlined, “Climate funds for coal highlight lack of UN rules.” The article points out the difficulty associated with using tools from industrial civilization to address a predicament created by industrial civilization: “Climate finance is critical to any global climate deal, and rich countries have pledged billions of dollars toward it in U.N. climate talks, which resume Monday in Lima, Peru. Yet there is no watchdog agency that ensures the money is spent in the most effective way. There’s not even a common definition on what climate finance is.” The bottom line from this story: About a billion dollars intended to mitigate climate change has been used to fund coal-fired power plants, the worst emitter of carbon dioxide on the planet. Writing for the Arctic News Group, John Davies concludes: “The world is probably at the start of a runaway Greenhouse Event which will end most human life on Earth before 2040.” He considers only atmospheric carbon dioxide concentration, not the many self-reinforcing feedback loops described below. Writing on 28 November 2013 and tacking on only one feedback loop — methane release from the Arctic Ocean — Sam Carana expects global temperature anomalies up to 20 C 2050 (an anomaly is an aberration, or deviation from long-term average). 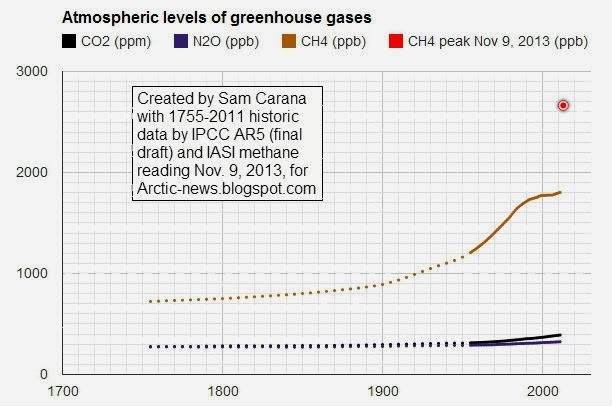 Small wonder atmospheric methane can cause such global catastrophe considering its dramatic rise during the last few years, as elucidated by Carana on 5 December 2013 in the figure below. On the topic of tipping points, we crossed the Rubicon in 2007 at about 0.76 C warming. At this point, according to David Spratt’s excellent September 2013 report, “Is Climate Already Dangerous?”, not only had Arctic sea-ice passed its tipping point, but the Greenland Ice Sheet was not far behind, as the Arctic moves to sea-ice-free conditions in summer (the U.S. Navy predicts an ice-free Arctic by summer 2016, a year later than earliest date expected by the Environmental Audit Committee of the United Kingdom Parliament, which points out that the six lowest September ice extents have occurred in the last six years, 2006-2012, and now we can add 2013 and 2014 to the list). Glaciologist Jason Box, an expert on Greenland ice, agrees. Box was quoted in a 5 December 2012 article in the Guardian: “In 2012 Greenland crossed a threshold where for the first time we saw complete surface melting at the highest elevations in what we used to call the dry snow zone. … As Greenland crosses the threshold and starts really melting in the upper elevations it really won’t recover from that unless the climate cools significantly for an extended period of time which doesn’t seem very likely.” (In January 2013, Box concluded we’ve locked in 69 feet — 21 meters — of sea-level rise.) Indeed, as stated that same year in the September issue of Global Policy, “because of increasing temperatures due to GHG emissions a suite of amplifying feedback mechanisms, such as massive methane leaks from the sub-sea Arctic Ocean, have engaged and are probably unstoppable.” By December 2013, the disappearance of Greenland’s ice had accelerated to five times the pace of a few years previously, and IPCC was acknowledging they’d been far too conservative with past estimates. Continued conservatism is buttressed by research reported in the 16 March 2014 issue of Nature Climate Change indicating melting of Greenland ice accounts for about one-sixth of recent sea-level rise and also by research published in the 18 May 2014 issue of Nature Geoscience indicating Greenland’s icy reaches are far more vulnerable to warm ocean waters from climate change than had been thought. Finally, a research paper published in the 13 June 2014 of Geophysical Research Letters points out that an ice-free Arctic is likely to cause rapid melting of Greenland ice. Ice matters. “Small fluctuations in the sizes of ice sheets during the last ice age were enough to trigger abrupt climate change,” as reported in the 13 August 2014 issue of Nature. As pointed out in the 25 September 2014 issue of Nature Communications, ice sheets melt for centuries once they begin the process. Not surprisingly, subsequent papers published in the 10 October 2014 issue of Environmental Research Letters and also the 14 January 2015 issue of Nature indicate all previous work on the topic of sea-level rise has been conservative. If you think we’ll adapt, think again, even if you’re the Wall Street Journal claiming on 2 September 2014 that it’s too late for mitigation. The rate of evolution trails the rate of climate change by a factor of 10,000, according to a paper in the August 2013 issue of Ecology Letters. Even once-rich habitats in Antarctica are becoming biologically impoverished as icebergs, increasingly breaking free from the surrounding sea ice, scour the shallow-water rocks and boulders on which a diversity of creatures cling to life (according to research published in the 16 June 2014 issue of Current Biology). And it’s not as if extinction events haven’t happened on this planet, as explained in the BBC program, The Day the Earth Nearly Died. The rate of climate change clearly has gone beyond linear, as indicated by the presence of the myriad self-reinforcing feedback loops described below, and now threatens our species with extinction in the near term. As Australian biologist Frank Fenner said in June 2010: “We’re going to become extinct,” the eminent scientist says. “Whatever we do now is too late.” Anthropologist Louise Leakey ponders our near-term demise in her 5 July 2013 assessment at Huffington Post and her father Richard joins the fray in this video from December 2013 (see particularly 1:02:18 – 1:02:56). Canadian wildlife biologist Neil Dawe joins the party of near-term extinction in an interview 29 August 2013 and musician-turned-activist Sir Bob Geldof joins the club in a Daily Star article from 6 October 2013. Health officials add their voices to the discussion about extinction in late March 2014, although they view 4 C as a problem to be dealt with later. Writing for Truth-Out, journalist John Feffer writes in his 27 April 2014 essay: “The planet and its hardier denizens may soldier on, but for us it will be game over.” American linguist and philosopher Noam Chomsky concludes we’re done in a 15 June 2014 interview with Chris Hedges at Truthdig, saying climate change “may doom us all, and not in the distant future.” Larry Schwartz, writing for AlterNet on 21 July 2014, concludes, “Many environmentalists think we have already passed the point of no return.” Johns Hopkins professor and fossil hunter Ken Rose agrees in an interview published 29 July 2014: “We’re in the middle of the sixth great extinction on Earth. It probably won’t take too long for humans to go extinct.” IT Project Manager Jennifer Hynes concludes near-term human extinction certain at the 1:20:30 mark of this comprehensive presentation about global methane release. Three weeks later, Robert Scribbler concludes in his assessment of global methane release, “What I’ve just described is the process that most scientists believe occurred during the worst mass extinction event in the geological past … what humans are now doing … may well be shockingly similar.” Motivational speaker, writer, and politician Marianne Williamson concludes near-term human extinction in her early October 2014 interview with Thom Hartmann. Chris Hedges agrees in an interview conducted 22 November 2014. Hollywood catches up with reality with the 23 November 2014 episode of HBO’s The Newsroom channels me: Catch a snippet here. Randy Malamud, Regents’ Professor at Georgia State University, writes for the Huffington Post on 8 December 2014: “it’s time to accept our impending demise.” Seemingly echoing many relatively wealthy, heterosexual, Caucasian men, writer Robert J. Burrowes adds his voice on 15 December 2014 in the Lahore Times: “In essence then, it is fear that drives dysfunctional environmental behaviours. And, history tells us, fear will prevent us taking sufficient action in time.” Paul Ehrlich absurdly hails the glories of civilization but correctly concludes human extinction in the near term with his 10 January 2015 interview with MSNBC. In the face of near-term human extinction, most Americans view the threat as distant and irrelevant, as illustrated by a 22 April 2013 article in the Washington Post based on poll results that echo the long-held sentiment that elected officials should be focused on the industrial economy, not far-away minor nuisances such as climate change. Supporters of carbon farming — the nonsensical notion that industrial civilization can be used to overcome a predicament created by industrial civilization — claim all we need to do is fill the desert with nonnative plants to the tune of an area three-quarters the size of the United States. And, they say, we’ll be able to lower atmospheric carbon dioxide by a whopping 17.5 ppm in only two decades. Well, how exciting. At that blistering pace, atmospheric carbon dioxide will be all the way back down to the reasonably safe level of 280 ppm in only 140 years, more than a century after humans are likely to become extinct from climate change. And, based on research published in the 2 May 2014 issue of Science, soil carbon storage has been over-estimated and is reduced as atmospheric carbon dioxide concentration rises. According to the plan presented in the 23 August 2013 issue of Scientific American, the nonnative plants, irrigated with increasingly rare fresh water pumped by increasingly rare fossil-fuel energy, will sequester carbon sufficient to overcome contemporary emissions. Never mind the emissions resulting from pumping the water, or the desirability of converting thriving deserts into monocultures, or the notion of maintaining industrial civilization at the expense of non-civilized humans and non-human species. Instead, ponder one simple thought: When the nonnative plants die, they will emit back into the atmosphere essentially all the carbon they sequestered. A tiny bit of the carbon will be stored in the soil. The rest goes into the atmosphere as a result of decomposition. This essay brings attention to recent projections and self-reinforcing feedback loops (i.e., positive feedbacks). I presented much of this information at the Bluegrass Bioneers conference (Alex Smith at Radio Ecoshock evaluates my presentation here). More recently, I presented an updated version in a studio in Bolingbrook, Illinois. All information and sources are readily confirmed with an online search, and links to information about feedbacks can be found here. Anyone who does not know what Latent Heat is will have a false sense of security. It is not hard to understand if I do not use physics jargon. Place on a hot stove a pot of cold water containing 1 kg of ice cubes. Stir the ice water with a long thermometer and take temperature readings. My question is: When will the thermometer begin to show a rise in temperature? Answer: After all the ice has melted. In other words, all the heat from the stove would first all go into melting the ice, without raising the water temperature. The amount of heat entering a system without raising the temperature of the system is called Latent Heat. It takes 80 calories of heat to melt one gram of ice. So in this case, the first 80,000 calories of heat from the stove went into melting the 1 kg of ice first. Only when the ice is all gone will the water temperature rise, and it will do so until it reaches 100C, when the water will begin to boil. Once again, Latent Heat comes into play, and the water temperature will stabilize at the boiling point – until all the water have changed from liquid to vapour, at which point the temperature of the dry pot will rise to the temperature of the flame itself. So how does this apply to Earth’s climate? Consider the Arctic Ocean to be a gigantic pot of ice water, and the sun as the stove. For as long as there is still sea ice to melt, the Arctic Ocean will remain relatively cool, in spite of the ever increasing solar heat entering the Arctic ocean due to ever decreasing ice cover. When the sea ice is gone in the summer, as early as the latter part of this decade, the Arctic Ocean’s temperature will steeply rise, and when it does, so will the global mean temperature, and all hell will break lose (sic). Between now and then, the Arctic Ocean continues to warm up. Some parts are warming faster than others, and ice is still providing a tremendous cooling impact where it persists. On a positive note, major assessments fail to account for economic collapse. However, due to the four-decade lag between emissions and temperature rise, the inconvenient fact that the world has emitted more than twice the industrial carbon dioxide emissions since 1970 as we did from the start of the Industrial Revolution through 1970, and also due to the feedback loops described below, I strongly suspect it’s too late for economic collapse to extend the run of our species. Indeed, as pointed out by Bruce Melton at Truth-out in a 26 December 2013 piece featuring climate scientist Wallace Broeker: “today we are operating on atmospheric concentrations of greenhouse gases from the 1970s. In the last 29 years we have emitted as many greenhouse gases as we emitted in the previous 236 years. Because of the great cooling effect of the oceans, we have not yet begun to see the warming that this recent doubling of greenhouse gases will bring.” Greenhouse gas emissions continue to accelerate even as the world’s industrial economy slows to a halt: Emissions grew nearly twice as fast during the first decade of the new millennium as in the previous 30 years, as reported in the 11 April 2014 issue of The Guardian. As it turns out, the so-called 40-year lag is dangerously conservative. A paper in the 3 December 2014 issue of Environmental Research Letters indicates that maximum warming from carbon dioxide emissions occurs about one decade after a carbon dioxide emission. Rising emissions during each of the last many decades points to a truly catastrophic future, and not long from now. Guy Callendar pointed out the delayed influence of rising carbon dioxide on temperature in a 1938 paper in the Quarterly Journal of the Royal Meteorological Society. The hand-drawn figure from the paper shown below clearly illustrates an irreversible rise in global-average temperature beginning about 1915, a few decades after the consumption of fossil fuels increased substantially. Callendar’s work was used by J.S. Sawyer in a 1972 paper published in Nature to predict an “increase of 25% CO2 expected by the end of the century … [and] … an increase of 0.6°C in the world temperature” with stunning accuracy. Astrophysicists have long believed Earth was near the center of the habitable zone for humans. Recent research published in the 10 March 2013 issue of Astrophysical Journal indicates Earth is on the inner edge of the habitable zone, and lies within 1% of inhabitability (1.5 million km, or 5 times the distance from Earth to Earth’s moon). A minor change in Earth’s atmosphere removes human habitat. Unfortunately, we’ve invoked major changes. The northern hemisphere is particularly susceptible to accelerated warming, as explained in the 8 April 2013 issue of Journal of Climate. Two days later, a paper in Nature confirmed that summers in the northern hemisphere are hotter than they’ve been for 600 years. As pointed out by Sherwood and Huber in the 25 May 2012 issue of the Proceedings of the National Academy of Sciences and then by James Hansen in his 15 April 2013 paper, humans cannot survive a wet-bulb temperature of 35 C (95 F). As described by the United Nations Advisory Group on Greenhouse Gases in 1990, “Beyond 1 degree C may elicit rapid, unpredictable and non-linear responses that could lead to extensive ecosystem damage” (link mirrored here). But, as David Spratt points out in this video from October 2014, 0.5 C is was a more reasonable target (he fails to recognize that 2 C is already locked in). James Hansen and crew finally caught up to the dire nature of 1 C warming 23 years after the U.N. warning, 28 self-reinforcing feedback loops too late. How important are these less-than-2 C targets? James Hansen is quoted in a 4 January 2011 interview with The Independent: “Two degrees Celsius is guaranteed disaster.” And consider the 8 November 2014 headline at Al Jazeera America: “Capping warming at 2 C not enough to avert disaster, climate experts warn.” Neither source recognizes that 2 C is already assured. Some green-washing solutionistas take refuge in the nuclear solution. It’s astonishing what one can conclude when grid-tied electricity is a viewed as a natural right. James Hansen’s endorsement notwithstanding, nuclear power plants cause, rather than prevent, additional warming of Earth. In other words, near-term extinction of humans was already guaranteed, to the knowledge of Obama and his administration (i.e., the Central Intelligence Agency, which runs the United States and controls presidential power). Even before the dire feedbacks were reported by the scientific community, the administration abandoned climate change as a significant issue because it knew we were done as early as 2009. Rather than shoulder the unenviable task of truth-teller, Obama did as his imperial higher-ups demanded: He lied about collapse, and he lied about climate change. And he still does. 1. This description combines subsea permafrost and methane hydrates in the Arctic. The two sources of methane are sufficiently similar to warrant considering them in combination. By 15 December 2013, methane bubbling up from the seafloor of the Arctic Ocean had sufficient force to prevent sea ice from forming in the area. 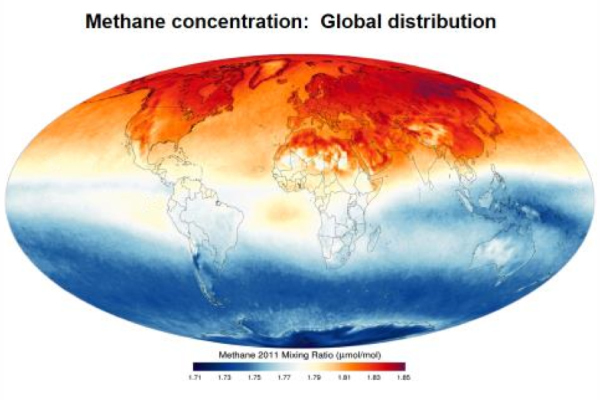 Nearly two years after his initial, oft-disparaged analysis, Malcolm Light concluded on 22 December 2013, “we have passed the methane hydrate tipping point and are now accelerating into extinction as the methane hydrate ‘Clathrate Gun’ has begun firing volleys of methane into the Arctic atmosphere.” According to Light’s analysis in late 2013, the temperature of Earth’s atmosphere will resemble that of Venus before 2100. Two weeks later, in an essay stressing near-term human extinction, Light concluded: “The Gulf Stream transport rate started the methane hydrate (clathrate) gun firing in the Arctic in 2007 when its energy/year exceeded 10 million times the amount of energy/year necessary to dissociate subsea Arctic methane hydrates.” The refereed journal literature, typically playing catch-up with reality, includes an article in the 3 February 2014 issue of Journal of Geophysical Research: Earth Surface claiming, “Sustained submergence into the future should increase gas venting rate roughly exponentially as sediments continue to warm.” Not surprisingly, the clathrate gun began firing in 2007, the same year the extent of Arctic sea ice reached a tipping point. Further confirmation the clathrate gun had been fired came from Stockholm University’s Örjan Gustafsson, who reported from the Laptev Sea on 23 July 2014: “results of preliminary analyses of seawater samples pointed towards levels of dissolved methane 10-50 times higher than background levels.” Jason Box responds to the news in the conservative fashion I’ve come to expect from academic scientists on 27 July 2014: “What’s the take home message, if you ask me? Because elevated atmospheric carbon from fossil fuel burning is the trigger mechanism poking the climate dragon. The trajectory we’re on is to awaken a runaway climate heating that will ravage global agricultural systems leading to mass famine, conflict. Sea level rise will be a small problem by comparison.” Later, during an interview with Vice published 1 August 2014, Box loosened up a bit, saying, “Even if a small fraction of the Arctic carbon were released to the atmosphere, we’re fucked.” Trust me, Jason, we’re there. One of the authors of two research papers rooted in the Siberian Kara Sea concluded on 22 December 2014, “If the temperature of the oceans increases by two degrees as suggested by some reports, it will accelerate the thawing to the extreme. A warming climate could lead to an explosive gas release from the shallow areas.” As we’ve known for a few years, 2 C is locked in. The importance of methane cannot be overstated. Increasingly, evidence points to a methane burst underlying the Great Dying associated with the end-Permian extinction event, as pointed out in the 31 March 2014 issue of Proceedings of the National Academy of Sciences. 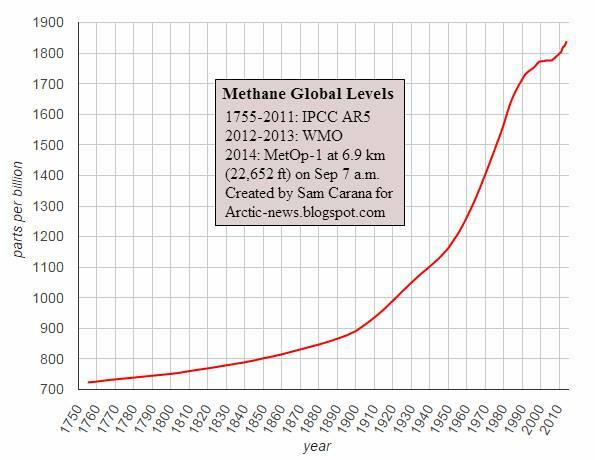 As Malcolm Light reported on 14 July 2014: “There are such massive reserves of methane in the subsea Arctic methane hydrates, that if only a few percent of them are released, they will lead to a jump in the average temperature of the Earth’s atmosphere of 10 degrees C and produce a ‘Permian’ style major extinction event which will kill us all. Discussion about methane release from the Arctic Ocean has been quite heated (pun intended). Paul Beckwith was criticized by the conservative website, Skeptical Science. His response from 9 August 2013 is here. Sam Carana includes the figure below in his 10 September 2014 analysis. 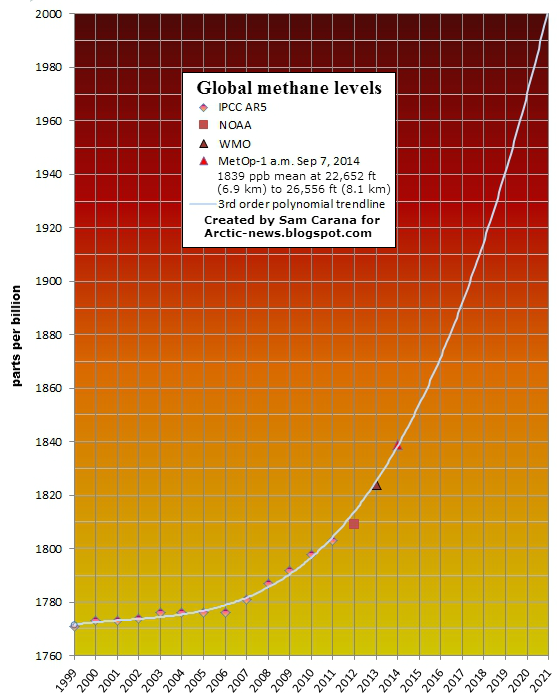 Based on data from several reputable sources, exponential release of methane clearly is under way. Robert Scribbler reaches the conclusion, finally, on 8 December 2014. 2. Warm Atlantic water is defrosting the Arctic as it shoots through the Fram Strait (Science, January 2011). Extent of Arctic sea ice passed a tipping point in 2007, according to research published in the February 2013 issue of The Cryosphere. On 6 October 2012, Truth-out cites Peter Wadhams, professor of ocean physics at Cambridge University: “The Arctic may be ice-free in summer as soon as 2015. Such a massive loss would have a warming effect roughly equivalent to all human activity to date. In other words, a summer ice-free Arctic could double the rate of warming of the planet as a whole.” Subsequent melting of Arctic ice is reducing albedo, hence enhancing absorption of solar energy. According to NASA on 17 December 2014, “the rate of absorbed solar radiation in the Arctic in June, July and August has increased by five percent” since 2000. “Averaged globally, this albedo change is equivalent to 25% of the direct forcing from CO2 during the past 30 years,” according to research published in the 17 February 2014 issue of the Proceedings of the National Academy of Sciences. Destabilization of the deep circulation in the Atlantic Ocean may be “spasmodic and abrupt rather than a more gradual increase” as earlier expected, according to a paper published in the 21 February 2014 issues of Science. Models continue to underestimate results relative to observations, as reported in the 10 March 2014 issue of Geophysical Research Letters. Consider, for example, the thinning “by more than 50 metres since 2012 — about one sixth of its original thickness — and that it is now flowing 25 times faster,” as reported in the 23 December 2014 issue of Geophysical Research Letters. 3. Siberian methane vents have increased in size from less than a meter across in the summer of 2010 to about a kilometer across in 2011 (Tellus, February 2011). According to a paper in the 12 April 2013 issue of Science, a major methane release is almost inevitable, which makes me wonder where the authors have been hiding. Almost inevitable, they report, regarding an ongoing event. Trees are tipping over and dying as permafrost thaws, thus illustrating how self-reinforcing feedback loops feed each other. 7. Methane is being released from the Antarctic, too (Nature, August 2012). According to a paper in the 24 July 2013 issue of Scientific Reports, melt rate in the Antarctic has caught up to the Arctic and the West Antarctic Ice Sheet is losing over 150 cubic kilometres of ice each year according to CryoSat observations published 11 December 2013, and Antarctica’s crumbling Larsen-B Ice Shelf is poised to finish its collapse, according to Ted Scambos, a glaciologist at the National Snow and Ice Data Center at the annual meeting of the American Geophysical Union. A paper in the 12 September 2014 issue of Science concluded the major collapse of the Larsen-B Ice Shelf in 2002 resulted from warm local air temperatures, indicating the importance of global and local warming on ice dynamics. Two days later a paper in Nature Climate Changeindicates that this sensitivity to temperature illustrates “that future increases in precipitation are unlikely to offset atmospheric-warming-induced melt of peripheral Antarctic Peninsula glaciers.”The rate of loss during the period 2010-2013 was double that during the period 2005-2010, according to a paper in the 16 June 2014 issue of Geophysical Research Letters. Loss of Antarctic ice is accelerating even in areas long considered stable, as documented in the 24 July 2013 edition of Scientific Reports. Further confirmation of large methane releases is revealed by noctilucent clouds over the southern hemisphere from 21 November 2013 to 6 December 2013. 8. Forest and bog fires are growing (in Russia, initially, according to NASA in August 2012), a phenomenon consequently apparent throughout the northern hemisphere(Nature Communications, July 2013). The New York Times reports hotter, drier conditions leading to huge fires in western North America as the “new normal” in their 1 July 2013 issue. A paper in the 22 July 2013 issue of the Proceedings of the National Academy of Sciences indicates boreal forests are burning at a rate exceeding that of the last 10,000 years. Los Alamos National Laboratory catches on during same month. According to reports from Canada’s Interagency Fire Center, total acres burned to date in early summer 2014 are more than six times that of a typical year. This rate of burning is unprecedented not just for this century, but for any period in Canada’s basement forest record over the last 10,000 years. A comprehensive assessment of biomass burning, published in the 21 July 2014 issue of Journal of Geophysical Research: Atmospheres, explains most of the global-average increase in temperature and explains that biomass burning causes much more global warming per unit weight than other human-associated carbon sources. By early August 2014 tundra fires were burning just 70 miles south of Arctic Ocean waters and the fires were creating their own weather via pyrocumulus clouds. Ignition sources are on the rise, too. According to a paper in the 14 November 2014 issue of Science, each 1 C rise in global-average temperature contributes to a 12 ± 5% increase in lightning strikes. 10. The Beaufort Gyre apparently has reversed course (U.S. National Snow and Ice Data Center, October 2012). Mechanics of this process are explained by the Woods Hole Oceanographic Institution here. 11. Exposure to sunlight increases bacterial conversion of exposed soil carbon, thus accelerating thawing of the permafrost (Proceedings of the National Academy of Sciences, February 2013). Subsequent carbon release “could be expected to more than double overall net C losses from tundra to the atmosphere,” as reported in the March 2014 issue of Ecology. Arctic permafrost houses about half the carbon stored in Earth’s soils, an estimated 1,400 to 1,850 petagrams of it, according to NASA. Peat chemistry changes as warming proceeds, which accelerates the process, as reported in the 7 April 2014 issue of Proceedings of the National Academy of Sciences. 12. The microbes have joined the party, too, according to a paper in the 23 February 2013 issue of New Scientist. A subsequent paper in the 22 October 2014 issue of Nature illustrates the key role of a single species of microbe in amplifying climate change. 14. Increased temperature and aridity in the southwestern interior of North America facilitates movement of dust from low-elevation deserts to high-elevation snowpack, thus accelerating snowmelt, as reported in the 17 May 2013 issue of Hydrology and Earth System Sciences. 15. Floods in Canada are sending pulses of silty water out through the Mackenzie Delta and into the Beaufort Sea, thus painting brown a wide section of the Arctic Ocean near the Mackenzie Delta brown (NASA, June 2013). Pictures of this phenomenon are shown on this NASA website. In a Heinrich Event, the melt forces eventually reach a tipping point. The warmer water has greatly softened the ice sheet. Floods of water flow out beneath the ice. Ice ponds grow into great lakes that may spill out both over top of the ice and underneath it. Large ice damns (sic) may or may not start to form. All through this time ice motion and melt is accelerating. Finally, a major tipping point is reached and in a single large event or ongoing series of such events, a massive surge of water and ice flush outward as the ice sheet enters an entirely chaotic state. Tsunamis of melt water rush out bearing their vast floatillas (sic) of ice burgs (sic), greatly contributing to sea level rise. And that’s when the weather really starts to get nasty. In the case of Greenland, the firing line for such events is the entire North Atlantic and, ultimately the Northern Hemisphere. 17. Breakdown of the thermohaline conveyor belt is happening in the Antarctic as well as the Arctic, thus leading to melting of Antarctic permafrost (Scientific Reports, July 2013). In the past 60 years, the ocean surface offshore Antarctica became less salty as a result of melting glaciers and more precipitation, as reported in the 2 March 2014 issue of Nature Climate Change. 20. Extreme weather events drive climate change, as reported in the 15 August 2013 issue of Nature (Nature, August 2013). Details are elucidated via modeling in the 6 June 2014 issue of Global Biogeochemical Cycles. 21. Drought-induced mortality of trees contributes to increased decomposition of carbon dioxide into the atmosphere and decreased sequestration of atmospheric carbon dioxide. Such mortality has been documented throughout the world since at least November 2000 in Nature, with recent summaries in the February 2013 issue of Nature for the tropics and in the August 2013 issue of Frontiers in Plant Science for temperate North America. One extremely important example of this phenomenon is occurring in the Amazon, where drought in 2010 led to the release of more carbon than the United States that year (Science, February 2011). The calculation badly underestimates the carbon release. In addition, ongoing deforestation in the region is driving declines in precipitation at a rate much faster than long thought, as reported in the 19 July 2013 issue of Geophysical Research Letters. An overview of the phenomenon, focused on the Amazon, was provided by Climate News Network on 5 March 2014. Tropical rain forests, long believed to represent the primary driver of atmospheric carbon dioxide, are on the verge of giving up that role. According to a 21 May 2014 paper published in Nature, “the higher turnover rates of carbon pools in semi-arid biomes are an increasingly important driver of global carbon cycle inter-annual variability,” indicating the emerging role of drylands in controlling environmental conditions. “Because of the deforestation of tropical rainforests in Brazil, significantly more carbon has been lost than was previously assumed.” In fact, “forest fragmentation results in up to a fifth more carbon dioxide being emitted by the vegetation.” These results come from the 7 October 2014 issue of Nature Communications. 22. Ocean acidification leads to release of less dimethyl sulphide (DMS) by plankton. DMS shields Earth from radiation. (Nature Climate Change, online 25 August 2013). Plankton form the base of the marine food web, and are on the verge of disappearing completely, according to a paper in the 18 October 2013 issue of Global Change Biology. As with carbon dioxide, ocean acidification is occurring rapidly, according to a paper in the 26 March 2014 issue of Global Biogeochemical Cycles. Acidification is proceeding at a pace unparalleled during the last 300 million years, according to research published in the 2 March 2012 issue of Science. 23. Jellyfish have assumed a primary role in the oceans of the world (26 September 2013 issue of the New York Times Review of Books, in a review of Lisa-ann Gershwin’s book, Stung! On Jellyfish Blooms and the Future of the Ocean): “We are creating a world more like the late Precambrian than the late 1800s — a world where jellyfish ruled the seas and organisms with shells didn’t exist. We are creating a world where we humans may soon be unable to survive, or want to.” Jellyfish contribute to climate change via (1) release of carbon-rich feces and mucus used by bacteria for respiration, thereby converting bacteria into carbon dioxide factories and (2) consumption of vast numbers of copepods and other plankton. 24. Sea-level rise causes slope collapse, tsunamis, and release of methane, as reported in the September 2013 issue of Geology. In eastern Siberia, the speed of coastal erosion has nearly doubled during the last four decades as the permafrost melts. The mechanism underlying methane release in these systems is poorly understood. If sunlight drives the process, as suggestd by a paper in the 22 August 2014 issue of Science, then amplification is expected over time as ponds and lakes are increasingly exposed. 28. Mixing of the jet stream is a catalyst, too. High methane releases follow fracturing of the jet stream, accounting for a previous rise in regional temperature up to 16 C in less than 20 years (Paul Beckwith via video on 19 December 2013). 35. Reductions in seasonal ice cover in the Arctic “result in larger waves, which in turn provide a mechanism to break up sea ice and accelerate ice retreat” (Geophysical Research Letters, 5 May 2014). 36. A huge hidden network of frozen methane and methane gas, along with dozens of spectacular flares firing up from the seabed, has been detected off the North Island of New Zealand (preliminary results reported in the 12 May 2014 issue of the New Zealand Herald). The first evidence of widespread active methane seepage in the Southern Ocean, off the sub-Antarctic island of South Georgia, was subsequently reported in the 1 October 2014 issue of Earth and Planetary Science Letters. 42. Dark snow is no longer restricted to Greenland. Rather, it’s come to much of the northern hemisphere, as reported in the 25 November 2014 issue of the Journal of Geophysical Research. Eric Holthaus’s description of this phenomenon in the 13 January 2015 edition of Slate includes a quote from one of the scientists involved in the research project: “The climate models need to be adding in a process they don’t currently have, because that stuff in the atmosphere is having a big climate effect.” In other words, as with the other major self-reinforcing feedback loops, dark snow is not included in contemporary models. 47. According to a paper in the 19 January 2015 issue of Nature Geoscience, melting glaciers contribute subsantial carbon to the atmosphere, with “approximately 13% of the annual flux of glacier dissolved organic carbon is a result of glacier mass loss. These losses are expected to accelerate." 48. Arctic drilling was fast-tracked by the Obama administration during the summer of 2012. As nearly as I can distinguish, only the latter two feedback processes are reversible at a temporal scale relevant to our species. Once you pull the tab on the can of beer, there’s no keeping the carbon dioxide from bubbling up and out. These feedbacks are not additive, they are multiplicative: They not only reinforce within a feedback, the feedbacks also reinforce among themselves (as realized even by Business Insider on 3 October 2013). Now that we’ve entered the era of expensive oil, I can’t imagine we’ll voluntarily terminate the process of drilling for oil and gas in the Arctic (or anywhere else). Nor will we willingly forgo a few dollars by failing to take advantage of the long-sought Northwest Passage or make any attempt to slow economic growth. Robin Westenra provides an assessment of these positive feedbacks at Seemorerocks on 14 July 2013. It’s worth a look. Never mind all that: Future temperatures likely will be at the higher end of the projected range because the forecasts are all too conservative and also because climate negotiations won’t avert catastrophe. Through late March 2013, global oceans have risen approximately ten millimeters per year during the last two years. This rate of rise is over three times the rate of sea level rise during the time of satellite-based observations from 1993 to the present. Ocean temperatures are rising, and have been impacting global fisheries for four decades, according to the 16 May 2013 issue of Nature. According to the World Meteorological Organization’s July 2014 report, the world is nearly five times as prone to disaster as it was 40 years ago. The number and economic cost of weather-related disasters has increased during each of the last four decades. Actually, catastrophe is already here, although it’s not widely distributed in the United States. Well, not yet, even though the continental U.S. experienced its highest temperature ever in 2012, shattering the 1998 record by a full degree Fahrenheit. But the east coast of North America experienced its hottest water temperatures all the way to the bottom of the ocean. The epic dust bowl of 2012 grew and grew and grew all summer long. As pointed out in the March 2004 issue of Geophysical Research Letters, disappearing sea ice is expectedly contributing to the drying of the western United States (more definitive research on the topic appeared in the December 2005 issue of Earth Interactions). Equally expectedly, the drought arrived 40 years early. Even James Hansen and Makiko Sato are asking whether the loss of ice on Greenland has gone exponential (while ridiculously calling for a carbon tax to “fix” the “problem”), and the tentative answer is not promising, based on very recent data, including a nearly five-fold increase in melting of Greenland’s ice since the 1990s and a stunning melting of 98 percent of Greenland’s ice surface between 8 and 15 July 2012. The explanation for this astonishing event comes from a paper published in the 10 June 2014 issue of the Proceedings of National Academy of Sciences: “[T]he same mechanism drove two widespread melt events that occurred over 100 years apart, in 1889 and 2012. We found that black carbon from forest fires and rising temperatures combined to cause both of these events.” Further elucidation is provided in the 14 June 2014 issue of Journal of Geophysical Research: Atmospheres. The mainstream media are finally taking notice, with the 18 July 2013 issue of Washington Post reporting the ninth highest April snow cover in the northern hemisphere giving way to the third lowest snow cover on record the following month (relevant records date to 1967, and the article is headlined, “Snow and Arctic sea ice extent plummet suddenly as globe bakes”). On a particularly dire note for humanity, climate change causes early death of 400,000 people each year causes early death of five million people each year. Adding to our misery are interactions between various aspects of environmental decay. For example, warming in the Arctic is causing the release of toxic chemicals long trapped in the region’s snow, ice, ocean and soil, according to research published in the 24 July 2011 issue of Nature Climate Change. In the category of myth busting comes recent research published in the August 2013 issue of Proceedings of the National Academy of Sciences. Contrary to the notion that changing solar radiation is responsible for rising global temperature, the amount of solar radiation passing through Earth’s atmosphere and reaching the ground globally peaked in the 1930s, substantially decreased from the 1940s to the 1970s, and changed little after that. Indeed, the current solar activity cycle is the weakest in a century. In addition, according to a paper in the 22 December 2013 issue of Nature GeoScience, climate change has not been strongly influenced by variations in heat from the sun. Global loss of sea ice matches the trend in the Arctic. It’s down, down, and down some more, with the five lowest values on record all happening in the last seven years (through 2012). As reported in a June 2013 issue of Science, the Antarctic’s ice shelves are melting from below. When interviewed for the associated article in the 13 June 2013 issue of National Geographic, scientists expressed surprise at the rate of change. Color me shocked. Three months later, the 13 September 2013 issue of Science contains another surprise for mainstream scientists: The Pine Island Glacier is melting from below as a result of warming seawater. And four months after that dire assessment, the massive glacier was melting irreversibly, according to a paper in the 12 January 2014 issue of Nature Climate Change (Robert Scribbler provides an overview of the latter phenomenon). The climate situation is much worse than I’ve led you to believe, and is accelerating far more rapidly than accounted for by models. Even the U.S. Centers for Disease Control and Prevention acknowledges, in a press release dated 6 June 2013, potentially lethal heat waves on the near horizon. Piling on a month later, the World Meteorological Organization pointed out that Earth experienced unprecedented recorded climate extremes during the decade 2001-2010, contributing to more than a 2,000 percent increase in heat-related deaths. Although climate change’s heat — not cold — is the real killer, according to research published in the December 2013 issue of the Journal of Economic Literature, swings in temperature may be even more lethal than high temperatures. Specifically, research published in the 29 January 2014 issue of the Proceedings of the Royal Society of London indicates insects are particularly vulnerable to temperature swings. Ice sheet loss continues to increase at both poles, and warming of the West Antarctic Ice Sheet is twice the earlier scientific estimate. Arctic ice at all-time low, half that of 1980, and the Arctic lost enough sea ice to cover Canada and Alaska in 2012 alone. In short, summer ice in the Arctic is nearly gone. Furthermore, the Arctic could well be free of ice by summer 2015, an event that last occurred about 2.6 million years ago, before the genus Homo walked the planet. Among the consequences of declining Arctic ice is extremes in cold weather in northern continents (thus illustrating why “climate change” is a better term than “global warming”). In a turn surprising only to mainstream climate scientists, Greenland ice is melting rapidly. The Eemian interglacial period that began some 125,000 years ago is often used as a model for contemporary climate change. However, as pointed out in the 5 June 2012 issue of Geophysical Research Letters, the Eemian differed in essential details from modern climatic conditions. The Eemian is a poor analog for contemporary climate change, notably with respect to the rapid, ongoing disappearance of summer ice in the Arctic. Even the conservative International Energy Agency has thrown in the towel, concluding that “renewable” energy is not keeping up with the old, dirty standard sources. As a result, the International Energy Agency report dated 17 April 2013 indicates the development of low-carbon energy is progressing too slowly to limit global warming. On the topic of rapidity of change, a paper in the August 2013 issue of Ecology Letters points out that rates of projected climate change dramatically exceed past rates of climatic niche evolution among vertebrate species. In other words, vertebrates cannot evolve or adapt rapidly enough to keep up with ongoing and projected changes in climate. How critical is Arctic ice? Whereas nearly 80 calories are required to melt a gram of ice at 0 C, adding 80 calories to the same gram of water at 0 C increases its temperature to 80 C. Anthropogenic greenhouse-gas emissions add more than 2.5 trillion calories to Earth’s surface every hour (ca. 3 watts per square meter, continuously). Ocean acidification associated with increased atmospheric carbon dioxide is proceeding at an unprecedented rate — the fastest in 300 million years — leading to great simplification of ecosystems, and capable of triggering mass extinction by itself. Already, half the Great Barrier Reef has died during the last three decades and the entire marine food web is threatened. As with many attributes, the Arctic Ocean leads the way in acidification. Similarly to the long lag in temperature relative to increase greenhouse gas emissions, changes in ocean acidity lag far behind alterations in atmospheric carbon dioxide, as reported in the 21 February 2014 issue of Environmental Research Letters. 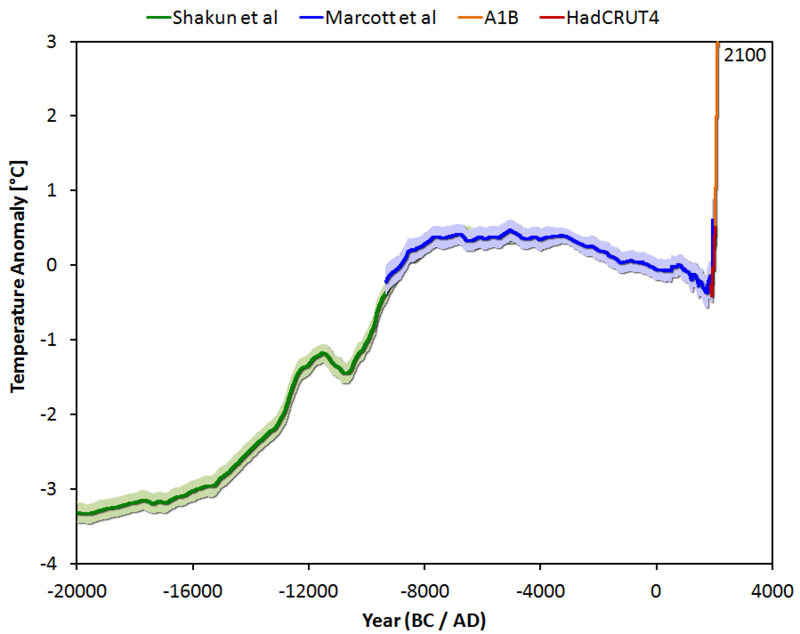 An increasing number of scientists agree that warming of 4 to 6 C causes a dead planet. And, they go on to say, we’ll be there much sooner than most people realize. Clive Hamilton concludes in his April 2013 book Earthmasters that “without [atmospheric sulfates associated with industrial activity] … Earth would be an extra 1.1 C warmer.” This estimate matches that of James Hansen and colleagues, who conclude 1.2 C cooling (plus or minus 0.2 C) as a result of atmospheric particulates (full paper in the 22 December 2011 issue of Atmospheric Chemistry and Physics is here. Both estimates are conservative relative to a paper in the 27 May 2013 issue of Journal of Geophysical Research: Atmospheres, which reports ~1 C temperature rise resulting from a 35-80% reduction in anthropogenic aerosols. In other words, collapse takes us directly to 2 C within a matter of weeks. According to a paper in the 24 November 2013 issue of Nature Climate Change, warming of the planet will continue long after emissions cease. Several other academic scientists have concluded, in the refereed journal literature no less, that the 2 C mark — long a political target, not a scientific target except among misinformed scientists — is essentially impossible (for example, see the review paper by Mark New and colleagues published in the 29 November 2010 issue of the Philosophical Transactions of the Royal Society A and the following line from a paper in the 12 March 2014 edition of Review of European, Comparative & International Environmental Law: “countries are farther from meeting their targets and the global community is farther from reaching the goal of limiting warming to 2°C above pre-industrial levels than emissions data suggest”). The German Institute for International and Security Affairs concluded 2 June 2013 that a 2 C rise in global-average temperature is no longer feasible (and Spiegel agrees, finally, in their 7 June 2013 issue), while the ultra-conservative International Energy Agency concludes that, “coal will nearly overtake oil as the dominant energy source by 2017 … without a major shift away from coal, average global temperatures could rise by 6 degrees Celsius by 2050, leading to devastating climate change.” At the 11:20 mark of this video, climate scientist Paul Beckwith indicates Earth could warm by 6 C within a decade (he drops the “could” in reinforcing the point in a 25 November 2014 video, “Abrupt climate change is underway already”, and he also concludes Earth could experience a 16 C temperature rise, albeit from 5 C lower than today’s global-average temperature). Beckwith is quoted by Dahr Jamail in the 13 January 2015 issue of Truthout: “It is my view that our climate system is in early stages of abrupt climate change that, unchecked, will lead to a temperature rise of 5 to 6 degrees Celsius within a decade or two.” If you think Beckwith’s view is extreme, consider (1) the 5 C rise in global-average temperature 55 million years ago during a span of 13 years (reported in the 1 October 2013 issue of Proceedings of the National Academy of Sciences, and questioned by a January 2015 paper in Climate of the Past), and also (2) the reconstruction of regional and global temperature for the past 11,300 years published in Science in March 2013. One result is shown in the figure below. It’s not merely scientists who know where we’re going. The Pentagon is bracing for public dissent over climate and energy shocks, as reported by Nafeez Ahmed in the 14 June 2013 issue of the Guardian. According to Ahmed’s article: “Top secret US National Security Agency (NSA) documents disclosed by the Guardian have shocked the world with revelations of a comprehensive US-based surveillance system with direct access to Facebook, Apple, Google, Microsoft and other tech giants. New Zealand court records suggest that data harvested by the NSA’s Prism system has been fed into the Five Eyes intelligence alliance whose members also include the UK, Canada, Australia and New Zealand.” In short, the “Pentagon knows that environmental, economic and other crises could provoke widespread public anger toward government and corporations” and is planning accordingly. Such “activity is linked to the last decade of US defence planning, which has been increasingly concerned by the risk of civil unrest at home triggered by catastrophic events linked to climate change, energy shocks or economic crisis — or all three.” In their 2014 Quadrennial Defense Review, the U.S. military concludes: “Climate change poses another significant challenge for the United States and the world at large. As greenhouse gas emissions increase, sea levels are rising, average global temperatures are increasing, and severe weather patterns are accelerating.” The global police state has arrived, and it’s accompanied by a subtle changes in Earth’s rotation that result from the melting of glaciers and ice sheets (i.e., climate change is causing Earth’s poles to shift).